. : Optics & Photonics Focus :: When Shape Really Matters :. 3D tomography of a nanoparticle. The 3D shape of a nanoparticle can be reconstructed from many 2D SEM images of the same. Once the 3D morphology of the nanoparticle is known, its optical response can be calculated with the algorithm developed by the researchers at the National University of Córdoba. The nanoworld features a very complex reality. In order to have a more thorough insight into this reality we need to employ the use of models – be that as it may, every model has its own limitations. The geometrical modeling of nanostructures, for example, has mostly been done through the use of ideal shapes. A new technique makes it possible to do away with any approximation in shape, thus bringing the model even closer to reality. This work is the product of the collaboration between researchers at the National University of Córdoba (Córdoba, Argentina), at the Bariloche Atomic Centre (San Carlos de Bariloche, Argentina), and at the University of Cambridge (Cambridge, UK). Nanotechnologies are already permeating many areas in science and technology, where they help interpret, and take advantage of, the world of the ultra-small. The design of materials at the nanometer scale in particular is becoming a routine process in many scientific disciplines. For this reason, even higher accuracy, reliability and reproducibility in the manufacturing of nanomaterials is of utmost importance. Furthermore, there is a need for models that can help interpret, predict and design the properties of such nanomaterials. Nanostructures are usually molded into shapes such as cubes, prisms or rods. This begs the question: to which extend do the objects of the nanoworld reproduce such ideal shapes? At a closer look, we will probably start noticing all kinds of surface defects and irregularities; this means that the particles are uglier than the actual ideal shape itself. We can get a vivid picture of this by making a parallel with the everyday world around us: in the middle of the Egyptian desert, for example, the Pyramids, from afar, look exactly like the shape they take their name from; a closer look, however, will reveal their rounded corners, the roughness of their walls, and quite a few more irregularities, undetected at first glance. The optical properties of metallic nanostructures are largely dependent on their shape. Very intense electromagnetic fields are generated on the surface of the metal when hit by light of the right color — color that can be tuned precisely by changing the shape of the nanostructure itself. In order to predict the behavior of metallic nanostructures, simulations have been performed mostly by approximating their shape with ideal geometries. There is, however, a problem with this approach! In practice, every single deviation from the ideal shape can substantially affect the final optical properties of the real nanostructure. "I started getting interested in this research topic," says Eduardo A. Coronado at the National University of Córdoba, "when trying to understand the factors that control the sensing capabilities of metallic probes used in many techniques, such as TERS and MEF. In order to understand how these probes work it is of fundamental importance to be able to correlate theory with experiments." The work of Coronado and colleagues combines an established technique for the reconstruction of the 3D shape of a nanoparticle (3D tomography) with a novel algorithm to calculate its optical properties. The new algorithm, unlike the previous ones, takes into account all the information of the 3D morphology of the nanoparticle. As Coronado says, "this achievement has only been possible thanks to the joint effort of the researchers at Cambridge University, who offered their expertise in 3D tomography, and the group here in Córdoba, who developed a suitable algorithm to simulate the optical response of the complex 3D nanoparticle." How to know the exact 3D shape of a nanostructure? The method that makes it possible is called 3D tomography and already finds application in many fields, such as radiology, archeology, material sciences and so on. The basic idea is that an image can only offer a 2D representation of an object, but many images, acquired from different perspectives, can be used to extract the 3D shape of the same object. The greater the number of images, the better the reconstruction. The first step of Coronado and colleagues’ proposal generates, in fact, an exact 3D geometrical model of the nanostructure from several SEM images. The challenge for the researchers was to develop an ad hoc method to calculate the optical response of such a complex 3D nanostructure. "The challenge for our group in Córdoba," Coronado explains, "was to develop a numerical algorithm, based on the Discrete Dipole Approximation (DDA) approach, which would be able to take into account all the features of the 3D shape of the nanostructure. So far all the simulations using this approach have been performed for nanoparticles whose shape was approximated by regular shapes, such as spheres, spheroids, cylinders, prisms or truncated prisms." 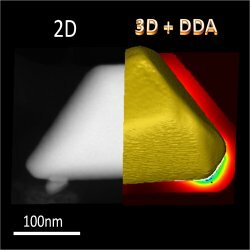 George C. Schatz at the Northwestern University (Illinois, USA) points out that "what is novel here is the combination of the 3D tomography technique for measuring the shape of a complex nanoparticle with the DDA approach for calculating its optical properties. Prior to this work, most of the optical property modeling was done using ideal particle shapes and, only in a few simple cases, was the shape of the particle derived by electron microscopy measurements." "The gathered 3D information has allowed us to correlate the structural and morphological characteristics of the nanostructure under study with their physico-chemical properties," Coronado explains. "There is no doubt that this correlation will also help redirect or optimize the present processes of fabrication in any nanotechnology field." The most straightforward application of these results is the molecular sensing mediated by nanostructures, where the gathered information could help detect the most suited particle for specific applications. Schatz confirms that "this work shows that nanoparticles are not the smooth objects we once thought them to be; they can have lumpy protrusions and irregular shapes. However, even these ugly particles might be effective for sensing applications. The results in the paper provide a simple way to determine when ugly particles might in fact have beautiful capabilities for applications in a broad range of technologies." Eduardo M. Perassi, Juan. C. Hernandez-Garrido, M. Sergio Moreno, Ezequiel R. Encina, Eduardo A. Coronado & Paul A. Midgley, Using Highly Accurate 3D Nanometrology to Model the Optical Properties of Highly Irregular Nanoparticles: A Powerful Tool for Rational Design of Plasmonic Devices, Nanoletters (2010) 10, 2097–2104 (link).